Burrito Blog: Did You Write That Down? Did You Write That Down? My lunch the other day reminds me of Chinese food with my boss about a year ago. Boss: I'd like the #4 lunch special. Waiter: What kind of soup? Waiter: OK. And for you? Boss: Wait, no MSG on mine. Boss: Did you write that down? No MSG. Boss: 'Cause I didn't see you write anything. Can you write it down? At El Pelon, they write down your order on a little slip of paper with your name before sending it back to the kitchen. I got the fish burrito with no mayo, which was correctly documented by the cashier. 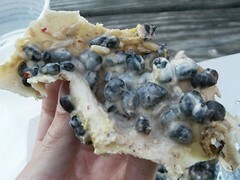 The picture clearly shows black beans smothered in that nasty mayo sauce. This would have been delicious if only they left out the mayo. Did you write that down? This El Pelon Taqueria meal was rated: 5.0. Tuesday, May 24, 2005 by Jonah.